Open the Licensing section on the left of the Configuration view. The Summary view of the Licensing section displays information about the license edition, license state, license days remaining and a spreadsheet of the available and used instances per each of the Veeam Backup & Replication infrastructure categories: virtual, physical and cloud machines. You can configure Veeam Backup Enterprise Manager to send notifications if your license expires. For more information on the Veeam Backup Enterprise Manager notification functionality, see the Configuring Notification Settings section of this guide. Each job for a respective type of the Veeam Backup & Replication infrastructure uses own multiplier per each instance. Instance cost multipliers depend on the product edition. For example, one Workstation machine consumes one license instance multiplied by 1 with the Standard Edition, by 0.5 with the Enterprise Edition and by 0.33 with the Enterprise Plus Edition. For more information on the Veeam Instance Licensing conversion, see Veeam Licensing Policy. To display detailed information about the current license, including type, expiration date and the number of instances, click the Details link. In the Summary view, click Install license. Select the necessary .LIC file and click Open. 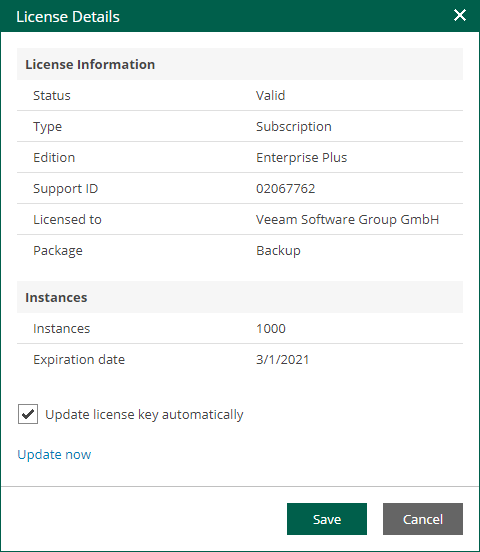 The new license will be applied to all connected Veeam backup servers automatically. In the Summary view, click Details. Veeam will connect to the web license management portal to obtain a new key (data will be communicated securely using HTTPS). You can instruct Veeam Backup Enterprise Manager to schedule automatic connection with Veeam licensing server and periodically send requests for a new license. For that, on the Details window, select the Update license key automatically check box. With this setting enabled, Veeam will start requesting a new license weekly, and 7 days before current license expiration date — daily. If this option is enabled in Enterprise Manager (even if deactivated in the Veeam backup console), automatic update will be performed anyway: Enterprise Manager will obtain a new key from Veeam licensing server and propagate it to all managed Veeam backup servers. For information on license management in Veeam Backup and Replication, see the Licensing section of the Veeam Backup & Replication User Guide. 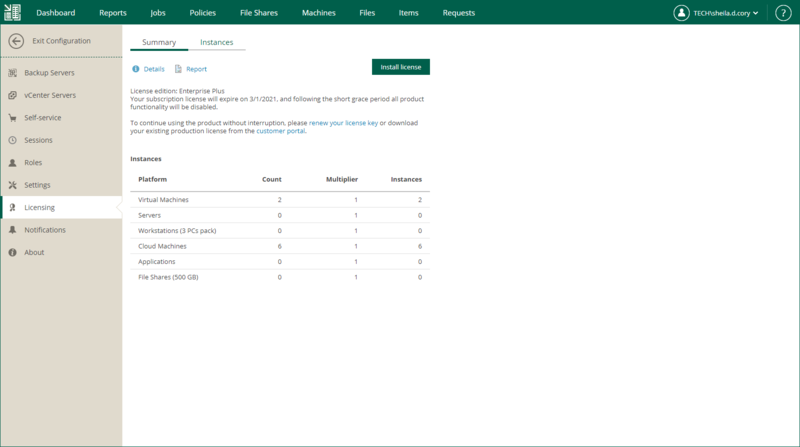 For information on license management for Veeam Cloud Connect Server Providers, see the Licensing for Service Providers section of the Veeam Cloud Connect Guide. Veeam also supports a grace period after the license expiration date. For subscription license, it lasts for 30 days, for rental license — 2 months. During this period the product will be running, but a warning about license expiration (grace period) will appear in the main window and in the sessions information. You must update your license before the end of the grace period. For more information on Veeam licensing, see the Veeam licensing article on the Frequently Asked Questions website.